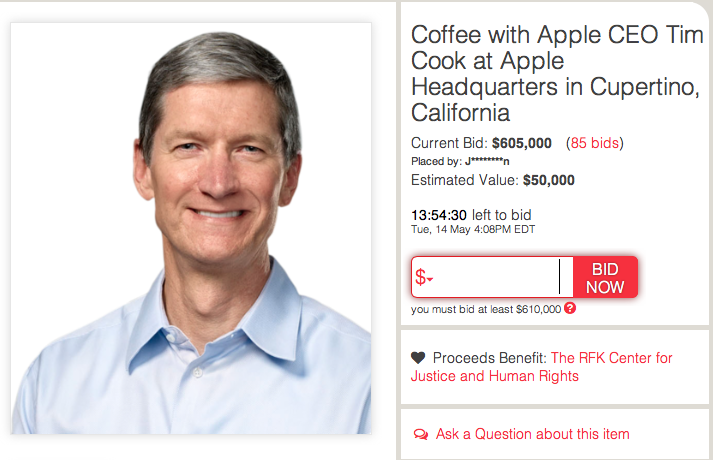 With less than 14 hours left to run, the CharityBuzz auction offering a coffee meeting with Apple CEO Tim Cook stands at an impressive $605,000. 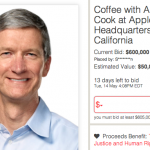 The winning bid will secure a meeting with Cook himself, which is expected to last between 30 minutes and one hour on "a mutually agreed upon date" at Apple's headquarters, and is valid for two people. Proceeds from the auction will benefit the RFK Center for Justice and Human Rights, and while a number of similar CharityBuzz auctions supporting this cause are also available, none have attracted bids as high as Cook's. 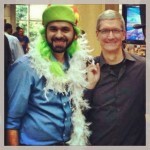 Interest in the Apple CEO's coffee meeting is indeed unparalleled. At the beginning of the month, we even heard that one CharityBuzz bid on Cook's auction had been made using a stolen credit card. However, the bid of $605,000 was promptly withdrawn. We'll let you know the outcome of the auction once it closes. In the meantime, see: Facebook For iOS Updated With New Photo Viewer Button For Saving, Sharing And More, Musician’s Corner: Learn How To Listen To The Notes With Beat The Melody, and It's Monster Crashing Time In The Latest TinyLegends Game.